The French multinational oil company has announced that it is no longer pursuing oil search offshore Western Sahara. "More good news for the Saharawi people. We urge the remaining oil companies to follow suit", stated WSRW. "Total has informed the Moroccan authorities that it would not request a new extension of its reconnaissance authorisation in the Anzarane block," a source told AFP today. "The first analysis of seismic data didn't find anything," added the source. AFP noted that Total's decision comes less than two weeks after an EU-Moroccan trade agreement was annulled by the Court of Justice of the EU for including the territory Western Sahara. Western Sahara has since 1975 been occupied by Morocco, and no countries in the world recognise Morocco's sovereignty over the territory, which is treated by the United Nations as the last unresolved colonial question in Africa. The court found, among other things, that Morocco fails to respect the UN Charter in relation to Western Sahara. 12 December, Africa Intelligence wrote a story in which it stated that the Moroccan state oil company ONHYM was still hoping for Total to renew. During the month of December, one of WSRW's member associations has tried to get an answer from Total, the answer being that we would have to wait until after Christmas for a reply. Total has held interests in Western Sahara from 2001 to 2004 and then from 2011 until today. 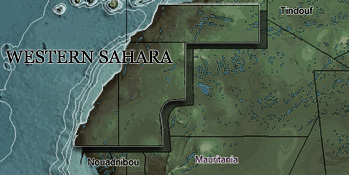 Its block, encompassing an area the size of Portugal, was located offshore Dakhla, in the southern parts of the territory. It is the company which done the most exploratory works in terms of seismic. Since December 2011, the company's agreements have been renewed every 12 months. Accordingly, WSRW was expecting news from Total this month, as to whether it would continue or discontinue. The Total source says its decision to pull out is due to lack of good results from the seismic studies. "The results of the geological surveys conducted in the Anzarane block... were not encouraging and the reconnaissance authorisation will not be transformed into an exploration licence," a Total spokesman told AFP. Some investors globally have excluded Total due to concerns over international law related to exploration activities in the occupied territory. "This is yet more good news for the Saharawi people, who have clearly and consistently condemned Total's operations. We welcome this decision by Total", stated board member Erik Hagen of Western Sahara Resource Watch. "We hope the remaining oil companies in Western Sahara will follow suit. As the Court of Justice of the EU has stated, it would be illegal to harvest the resources of Western Sahara unless it is to the benefit and wishes of the people of the territory. We urge all investors to put pressure on Glencore, Kosmos, Cairn and San Leon Energy to immediately terminate the oil exploration they are engaged in", stated Hagen. In 2013, WSRW published the report below, "Totally Wrong", outlining the legal and ethical aspects of the dirty oil programme, done on behalf of the Moroccan government.